Vision Design Group is pleased to announce the launch of a new website for the City of Winona located in Winona, Minnesota. 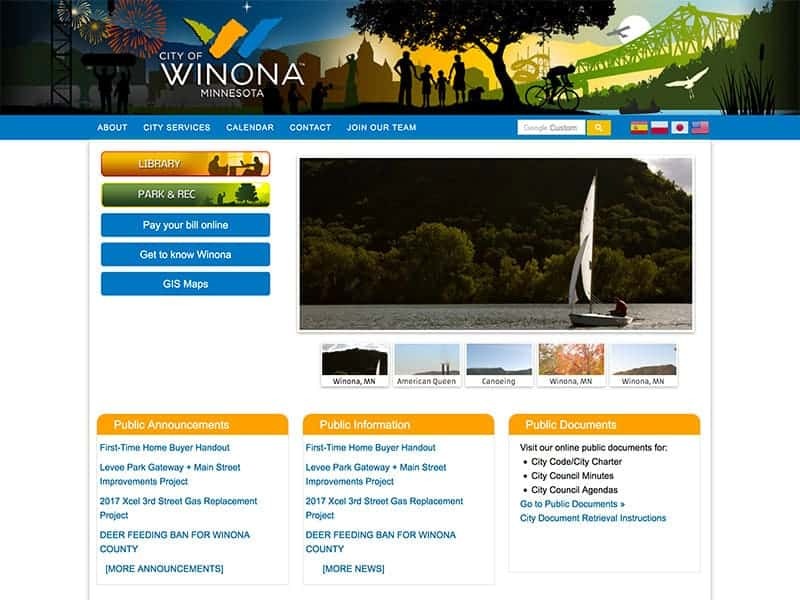 In addition to city services, the City of Winona website includes content related to the Winona Library and parks and recreation department. This website features News & Public Notices, and an extensive library of public documents. Google Calendar functionality is used to make it easy for staff to update the public meetings calendar. A password protected intranet site is included for city employees to access a wide variety of documentation and human resources materials. A responsive design is used to allow all types of devices, including tablets and smartphones, to view and navigate the website. In addition to the ability to search the entire website using the search field, there are several ways to navigate the site to find a specific department and contacts related to that area. Looking for a new website? Contact Vision Design Group today!